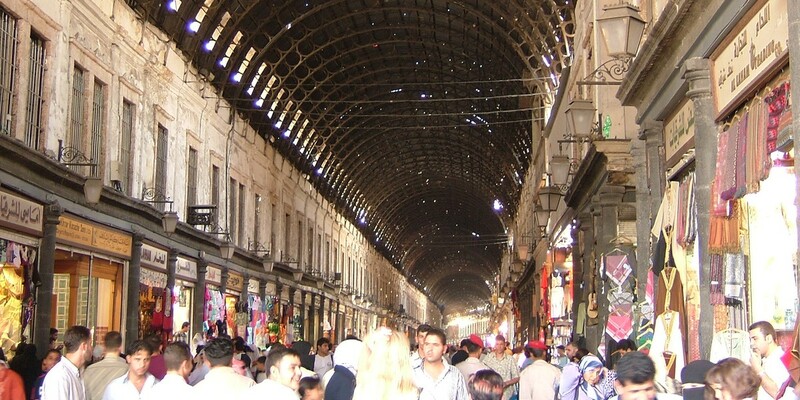 Damascus Hamidiyeh market in 2005. The roof is riddled with bullet holes from French machine gun fire from warplanes during a rebellion against French colonial rule. Mercenaries, militia, paramilitary forces, and standing armies from numerous countries are present in Syria in the present international war underway within that country. Foreign armies have been in Syria before. Your unit has been ordered to Syria. Soon you will be standing on the shores of a sea or a desert which has played a great part in world history. This quote introduces a historic document intended to inform occupying soldiers from a past conflict. We’ll soon return to this guidebook. As for now, Syria is fractured between warring factions, each partnered with or plainly maintained by a variety of outside state actors. Civil war serves as a convenient cover for proxy or indirect wars between divergent international powers. These powers – the most active among which are France, Iran, Israel, Russia, the United Arab Emirates, the United Kingdom, the United States, Saudi Arabia, Turkey, and Qatar – hold to their national interests in conjunction with lasting to temporary partnerships with select member-competitors. The indirect war has had very direct consequences for Syria, its people, and a broad region outside its contested borders. The most obvious results of which are numerous dead and displaced people, destroyed irrigation and farmland, demolished roads and bridges, exploded power plants, and many more destroyed material and social infrastructure. There are further consequences. The commitment to war is rather a commitment to a contest for the distribution of power. The result is a transformation of Syria, a reformation of West Asia within a broader international context, and the formulation of a global order and division of power among some of the planet’s state and non-state actors for which Syria plays a component role. Syria and West Asia are important for their location. Syria sits by a junction between continents. Asia and Europe make close encounter in the vicinity and passage to Africa is not that far off. Where once many centuries’ long flow of trade passed in what’s sometimes known as the Silk Road, new silk roads of rail, pipes, and asphalt may yet emerge through regional Eurasian efforts that include China’s much touted Belt and Road Initiative. There are other geopolitical attractions depending on who is looking. Significant oil and natural gas deposits are not far, and could transit through Syria to reach consumers or distribution hubs. The country is near to regional powers that can be contained or at least put on caution by that bloc which emerges as ally and kingmaker to whatever authority claims a whole or part of Syria. It may also serve as a means of eroding or expanding the legitimacy of a particular assumption of global order represented by whatever international bloc that is seen to win or lose significant battles in this epoch of perceived change. Returning now to the quote earlier mentioned, we can see the outline of just how Syria could play “a great part in world history”. 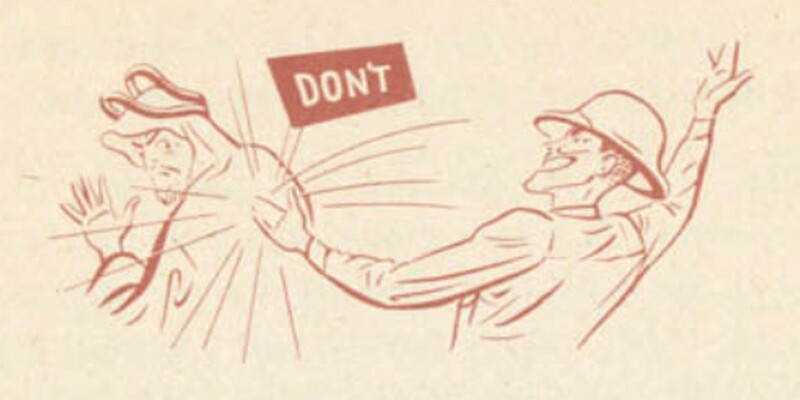 Drawing from inside A Short Guide to Syria, written by the US military, for its soldiers in Syria. That extract is from A Short Guide to Syria, by the US military for its soldiers who successfully invaded the country that was then in the possession of Vichy France. Vichy France was the World War Two government under Nazi Germany’s influence. The Vichy based government of France was also governor of a colonial realm that included Syria and Lebanon. Colonial Syria, then under Vichy suzerainty, and indirectly tied to the German power was the target of British and US attack. It was not every country that received such attention in that war: a testament to the lasting geopolitical importance of Syria. The public domain document is made available thanks to a very interesting online digital library organised by the Government Information Resources of the Southern Methodist University, in the US. You can read A Short Guide to Syria as a colour PDF copy. Take note that Syria and Lebanon were once under colonial rule, and that the modern borders of West Asia / Middle East were largely drawn up by European powers following World War One. Many of the current tensions and trends of that region were already established in the aftermath of that century past European war. For this reason, I recommend reading the detailed and approachable book on the subject by the prolific journalist and correspondent, Robert Fisk. The book, The Great War for Civilisation is useful to those who know nothing of that particular history as well as those who already have a good grasp of it.